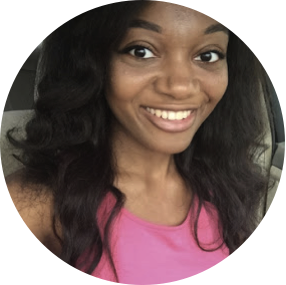 Read Ashley B's review of Serenity. The mysterious past of a fishing boat captain comes back to haunt him, when his ex-wife tracks him down with a desperate plea for help, ensnaring his life in a new reality that may not be all that it seems. Serenity is in theaters on January 25th, 2019. 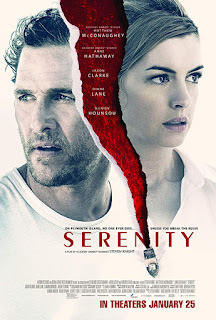 Serenity follows captain Baker Dill (Matthew McConaughey) who guides boat tours off of the island of Plymouth. Dill’s life is in disarray due to his obsession with a tuna fish and he struggles to stay afloat financially and mentally because of it. When a woman named Karen (Anne Hathaway) suddenly appears, his life becomes even more off track. Can this thriller keep audiences guessing or is the thrill lacking the necessary luster? This movie starts off slow but builds up to a point of giving viewers just enough information to want more but not enough initially to put it together. That taunting feeling of there is a twist around the corner but not having any concrete clues on what it might be was enough to make me think this was going to be a good thriller. The acting was not the best but served its purpose in pushing forward that thrilling feeling. As each character was introduced it felt like their backgrounds were all so hazy adding to the overall effect. It felt like they were all pointing in the direction of an underlying secret but it was difficult to figure it out which usually makes for a decent movie. Where it falters is when the plot twist is revealed then everything else seems to go no where. This is especially frustrating because the twist could have really been something big but instead turned into something lacking in almost every way. I do not recommend running out to watch this movie right away in theaters. It essentially builds up an equation that does not add up and left me wondering why it plummeted into such a mess.